The fight for ladies' equal rights on the links had no stars or crusaders; stellar communal performance was the key. In a July 15, 1920 article in the Sarasota Times newspaper, Colonel John Hamilton Gillespie revealed some of the societal hazards that lady golfers had to overcome in order to gain the privilege of encountering fairway hazards. "In the 1860s ladies were asked not to walk around the course with their husband, and their presence on the links was undesired save and except at the clubhouse at St. Andrews." A leading magazine in April of 1867 stated that the "golfer's wife must not accompany him on the course, because they talk incessantly, they never stand still, and if they do, the wind won't allow their dresses to stand still." 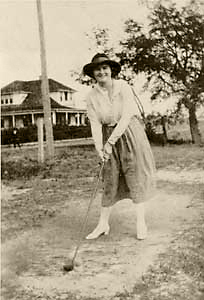 The photo shows Louise Higel teeing off at Colonel Gillespie's nine-hole golf course on present-day (Charles) Ringling Boulevard in Sarasota, circa 1916. Nowadays, hundreds of ladies can be found daily using any one of sixty golf courses in the Sarasota-Manatee-Charlotte counties area, supporting some untold thousands of employees, including some female club managers and teaching pros. Live is good.